My husband, Marcello, & I have been parents for about seven years now. We are still newbies by a lot of standards, but we are veterans compared to some others. We have grown A LOT as parents over these last few years, & we have found our rhythm. This really became clear to me this weekend. We had a crazy week last week, and we spent Sunday having a lazy day around the house trying to play catch up with the house, the kids, work, & everything else. As I was getting ready for bed Sunday night, I realized that Marcello & I hadn’t talked much throughout the day. We didn’t discuss what needed done or even who was going to do which tasks – it just happened. Meals were made, kids were bathed, laundry was done, floors were cleaned, books were read, naps were taken, to do lists were checked off. While the kids were content with me, Marcello dozed off on the living room floor. While the boys played video games, I snuck away to get a little work done. When the laundry buzzer went off, whoever had a free moment made the switch. When a child complained that they were hungry, someone provided some food. And it made me realize that there is something profoundly beautiful about that type of relationship. We didn’t go do some exciting family activity. We didn’t hold hands while we strolled on the beach. We didn’t go out to a fancy dinner (I think we ate soup & grilled cheese). We didn’t have deep conversations. We just lived together. I feel lucky to have someone that I can just be with. Lucky that I have a partner in life that makes my life easier & more enjoyable – even on the lazy days. 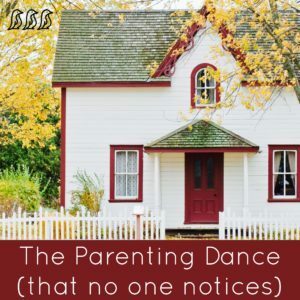 Lucky that we have found our rhythm to be rocking the parenting dance that is never choreographed & always different.